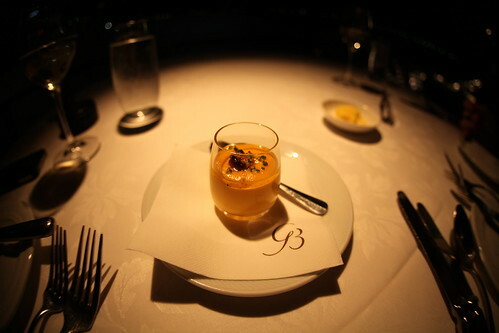 Guillaume at Bennelong has to be one of my the favourite rooms in Sydney. By day, it may seem cold and unfriendly, but by the night, the beautiful city lights shine in showing off the stunning industrial curves. 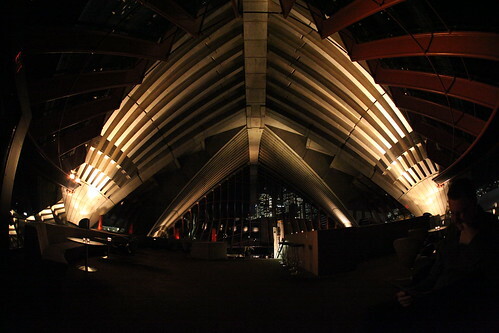 We’re here tonight because it will be the end of an era with Guillaume at Bennelong to raise it’s final hurrah in December. 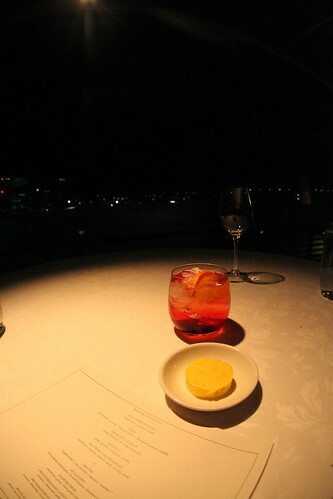 The restaurant’s ambience is amazing, especially with a table by the edge where you can stare into the Sydney skyline. 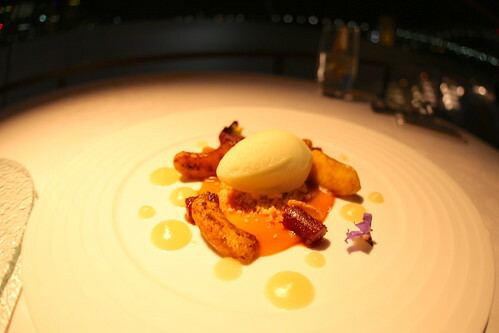 There’s a degustation option but we’re feeling the confident and decisive mood tonight so we opt for the al carte menu which is three savouries and a sweet. 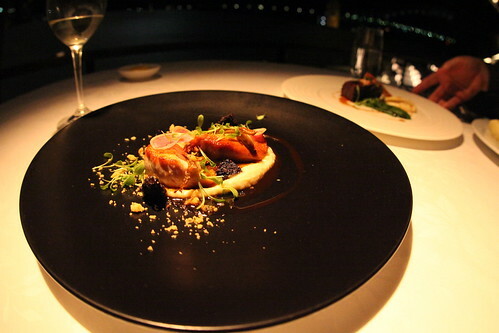 With the feeling of diving into an edible garden, the Royale was one of my favourites with an unexpected mix of soft and silky textures yet crunchy with bites of speck and croutons. 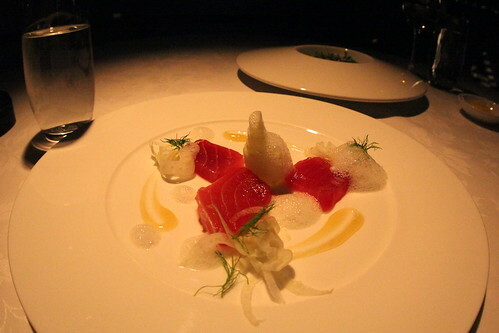 Being an anti-foam fan, one of the specials of the night was a little downer – it was a beautiful cut of sashimi but inside I was hoping there would be something more. 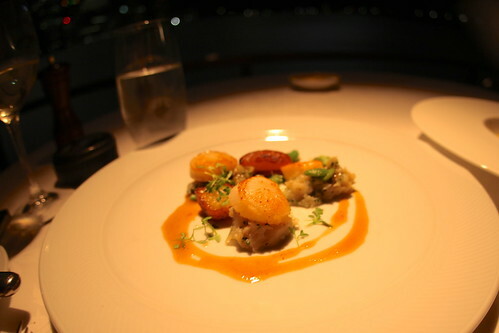 Scallops are always a delight to order, and these ones are seared just right and companied with the simplest of flavours; a bite size bed of artichoke and scattered broad beans. 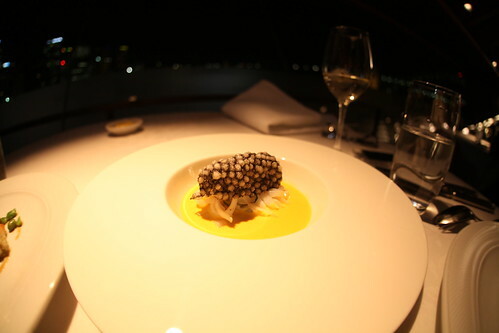 Resembling like a horror story from under the sea, the Squid tastes like no dish other. Finely sliced squid to imitate tagliatelle swims in a sea urchin consommé and topped with squid ink tapioca cracker. 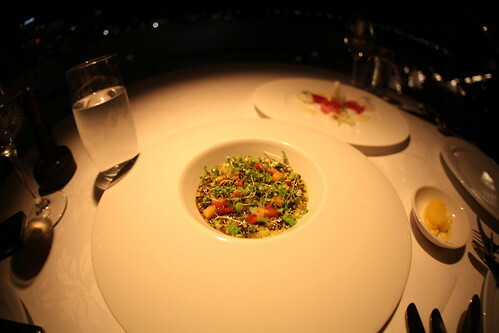 For those who squirm at the words of “sea urchin”, the consommé is so light and complementary that the words pass you by. The last of the savouries show off what Guillaume is all about, simplistic French dining showing off seasonal food. The Wagyu Beef is melt in your mouth goodness served with wholesome winter veggie flavours, such as potatoes and parsnips and the pork is matched with its ol’ friends, apple and celeriac. 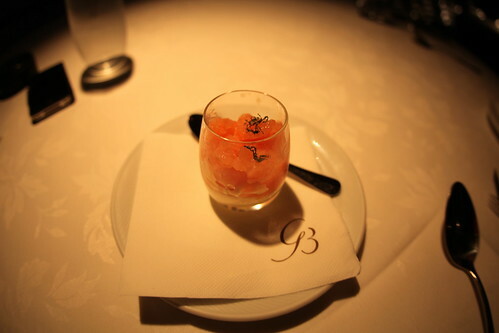 I love the idea of a palette cleanser before dessert, and although the tartness of this granita pulled my face into all sorts of squinting faces, I couldn’t stop eating it by the spoonful. 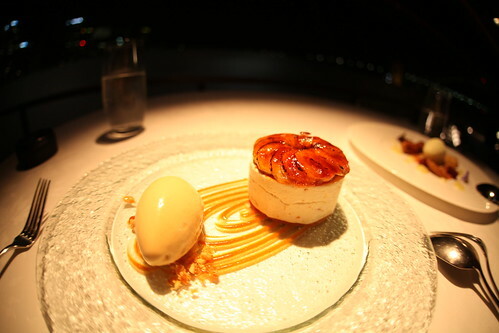 Yes, after a night of Frenchyness (food and waiter accents), the cheese should have been in order, but being a temperamental lactose intolerant sufferer, it was straight to proper dessert. The two choices complement so well with the Nougat Glace being incredibly indulgent and rich in banana, caramel and peanuts, while the Quince is fresh and light. Sad to see another one go, but it’s time to celebrate and enjoy! Sad to hear that it’s closing down – how unfortunate 😦 Hopefully I’ll manage to drag myself over before it does! I wont be able to go before it closes – real shame. Great photos as always, love that lens! Yes it’s my fish eye! I’m sad I won’t be seeing this place in it’s current form (I hear it may possibly be reopening elsewhere). Looks amazing! Yes, they are reopening, but they don’t know where yet! It’s sad to see it go. 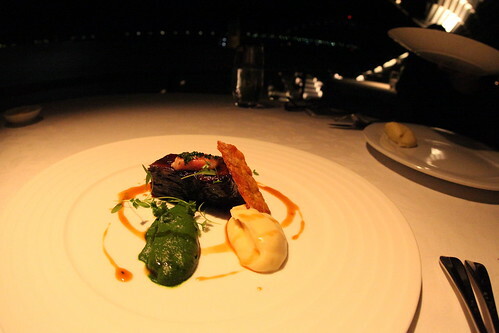 What a view and a great idea to see it out with a lovely dinner!